IOS-XE Denali represents Cisco’s effort to bring a single code base across their enterprise line of networking equipment, meaning the same operating system will run Catalyst, ISR, and ASR platforms. IOS-XE 3.7 will be the “end of the track” for the 3.X train of code on Catalyst 3650/3850… so to speak. 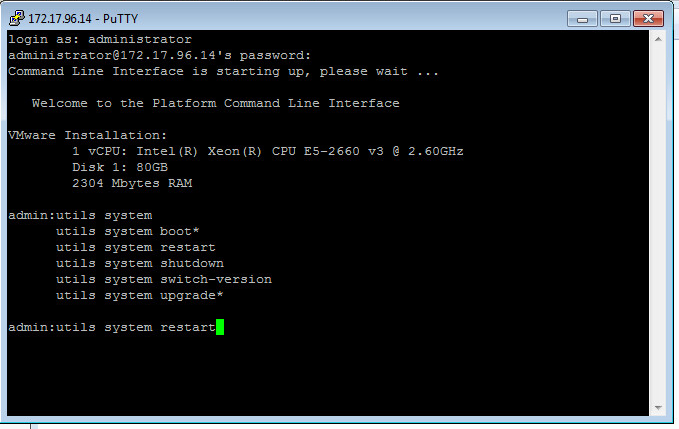 Below are the steps I used to upgrade a 3850 from IOS-XE 03.06.03E to IOS-XE 16.3.5b Denali. The switches were in “install mode” and these steps are specific for that method. To check your mode you can issue a show version command and look under the Mode column. 3850s should come from the factory in install mode; bundle mode is similar to the older upgrade method where you boot from a monolithic bin file. More info on install mode and bundle mode can be found here. If you’re looking to free up some space to copy over your new version you can run a software clean command to clean up any unused packages. : % flash: requires 526972 KB of free space, but only 124364 KB is available. Operation aborted. : % An internal error was encountered. Operation aborted. : % flash: requires 526972 KB of free space, but only 124364 KB is available. Operation aborted. : % An internal error was encountered. Operation aborted. Copy over your new ios version via any support method (usb, tftp, scp, etc.). We’ll use the software install set of commands with the force and new flags since we’re going from 3.X up to 16.X. Once completed type yes to initiate your reload. There is some micro code upgrades that may take some time so you’re looking at about 10+ minutes of down time. : Finished installing software. New software will load on reboot. 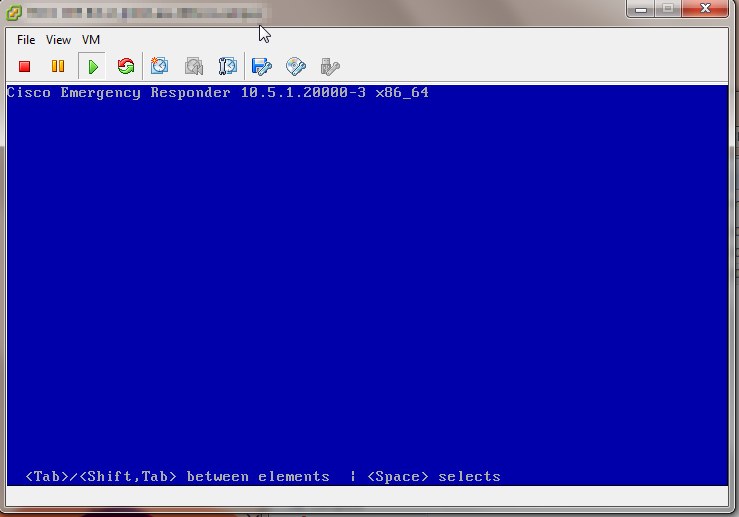 Booting...Initializing and Testing RAM ++++@@@@####...################################++@@++@@++@@++@@++@@++@@++@@++@@++@@++@@++@@++@@++@@++@@++@@++@@done. flashfs: flashfs fsck took 1 seconds....done Initializing Flash. Bootable image segment 0 address range [0x81100000, 0x81b8adc0] is in range [0x80180000, 0x90000000]. Front-end Microcode IMG MGR: found 4 microcode images for 1 device. Front-end Microcode IMG MGR: Preparing to program device...594412 bytes.... Skipped. Front-end Microcode IMG MGR: Preparing to program device...393342 bytes. Front-end Microcode IMG MGR: Programming device 0...rrrrrrw..0%....10%....20%......30%...40%......50%....60%......70%...80%......90%....100%wRr! Front-end Microcode IMG MGR: Microcode programming complete for device 0. Front-end Microcode IMG MGR: Preparing to program device...86370 bytes.... Skipped. 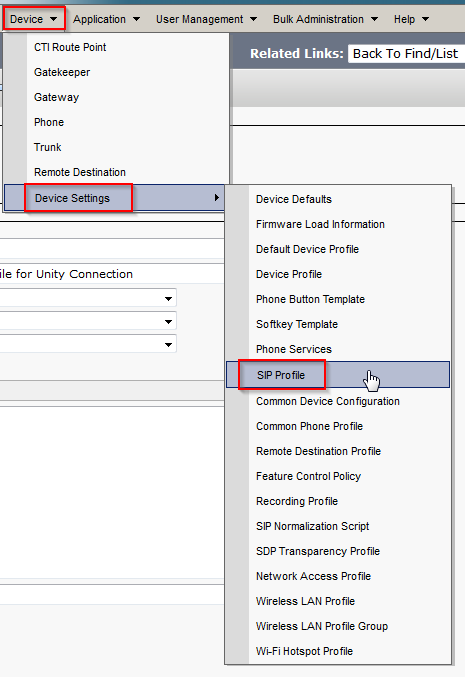 Below are the steps to configure SIP integration between CUCM and Unity Connection. This is now the Cisco recommended best practice and replaces the legacy CTI Route Point configuration. Enter a Profile Name and Description, check Accept Out-of-Dialog REFER, Accept Unsolicited Notification, Accept Replaces Header. Click Save. To right of Standard SIP Profile click Copy. Enter a Name and Description for the SIP Profile. 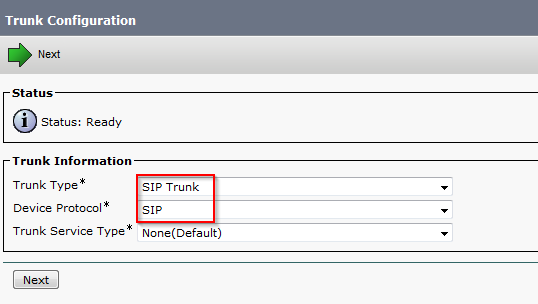 I also like to enable SIP OPTIONS Ping, this will let you know if the SIP Trunk has been established, and for how long it has been up, on the Find and List Trunks page. Click Save when completed. 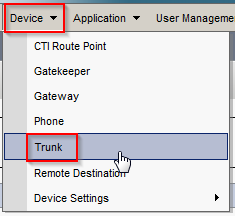 In CUCM, navigate to Device > Trunk. Click Add New, select SIP Trunk and SIP from the drop down menus and click Next. Enter a Device Name and Description. 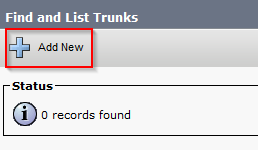 Select the proper Device Pool for the Trunk. 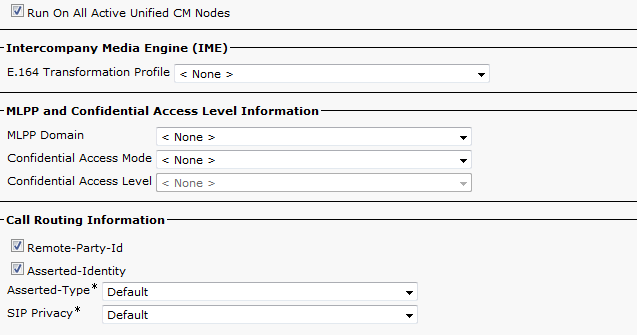 Check Run On All Active Unified CM Nodes. Under Inbound Calls select the CSS for inbound CUXN if you have one and check Redirecting Diversion Header Delivery – Inbound. Be sure to set a Rerouting Calling Search Space to ensure the calls can be transferred from Unity back to CUCM. Under SIP Information enter the Destination Address of the Unity Connection Publisher. This can be an IP address or DNS name. 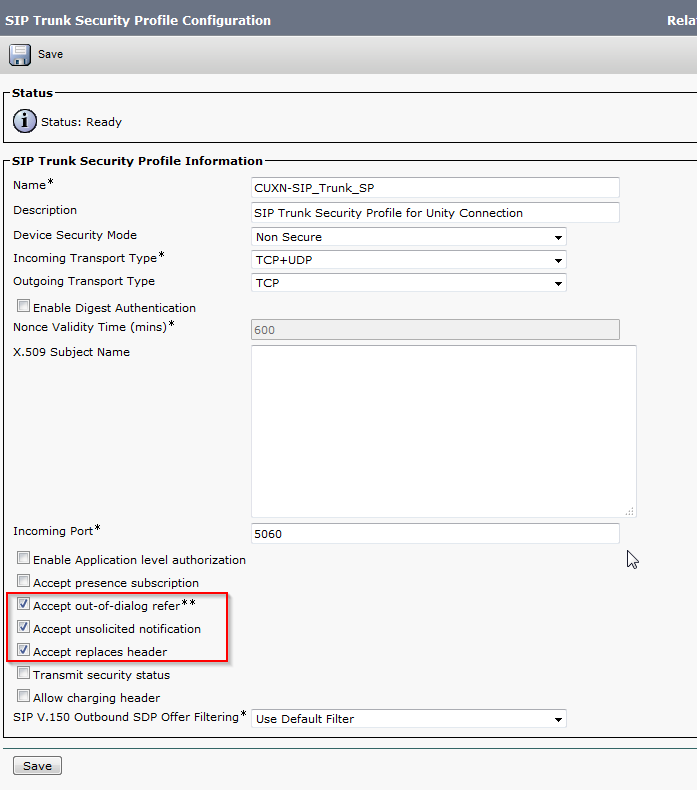 Change the SIP Trunk Security Profile to the new profile we made earlier. Change the SIP Profile to the profile we made earlier. Click Save. 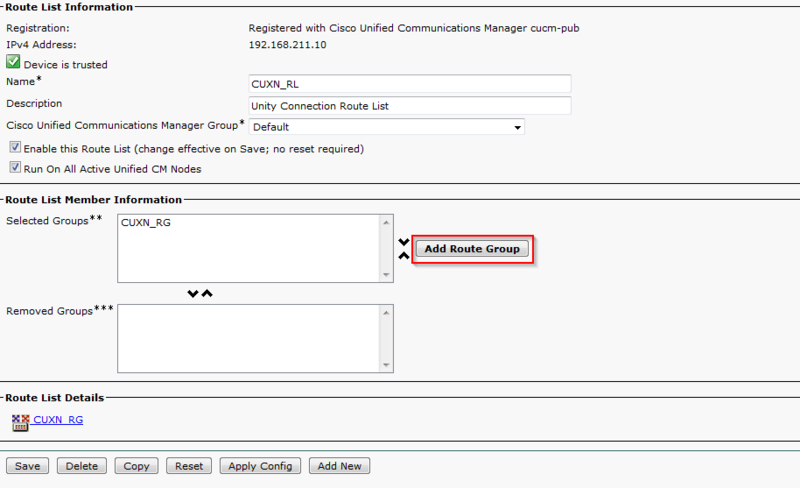 In CUCM, navigate to Call Routing > Route/Hunt > Route Group. Click Add New. Enter a name for the Route Group, change Distribution Algorithm to Top Down. 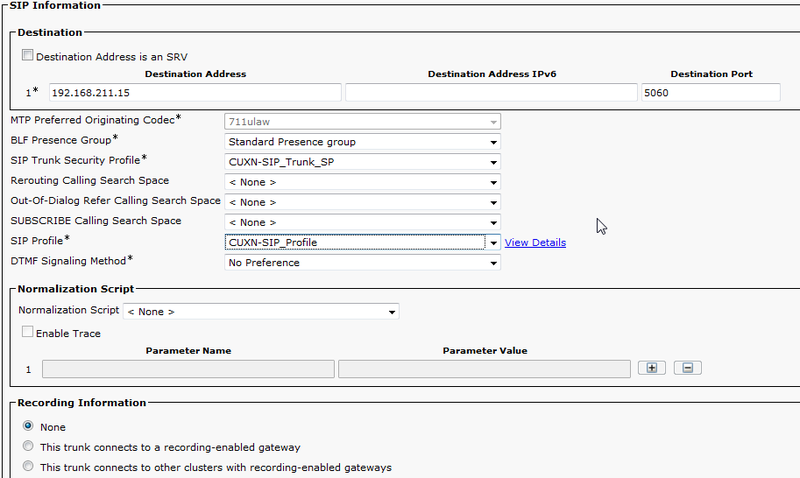 Find the newly created SIP trunk under Find Devices and click Add to Route Group. Click Save. 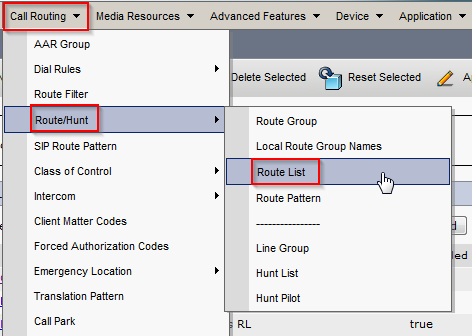 In CUCM, navigate to Call Routing > Route/Hunt > Route List. Click Add New. Enter a name for the Route List and click Save. 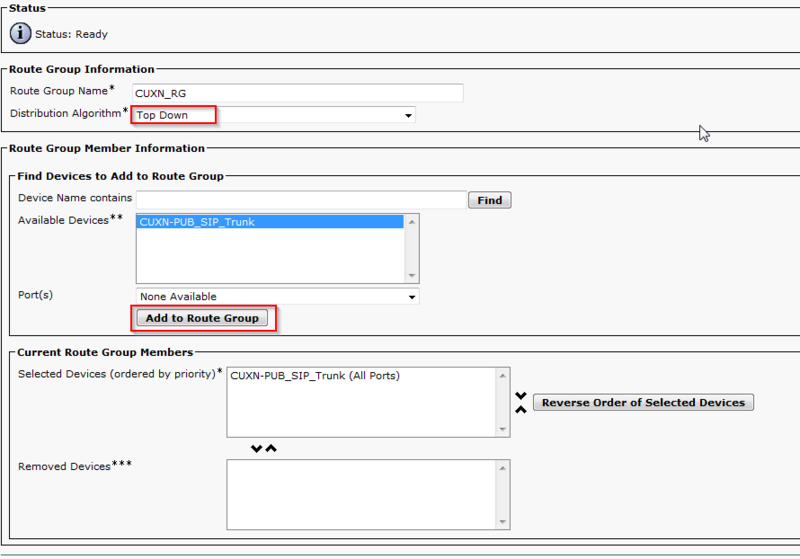 Click Add Route Group. 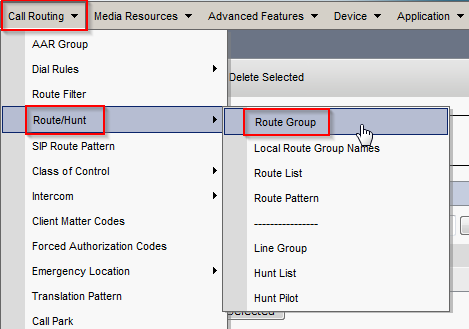 Select the previously configured Route Group from the drop down menu and click Save. 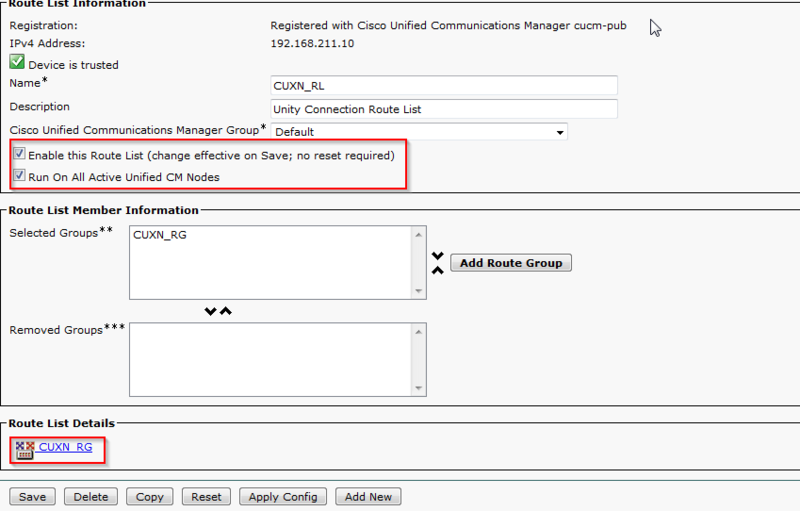 Confirm that Enable This Route List and Run On All Active Unified CM Nodes are checked and that the correct Route List is displayed under Route List Details. Click Save. 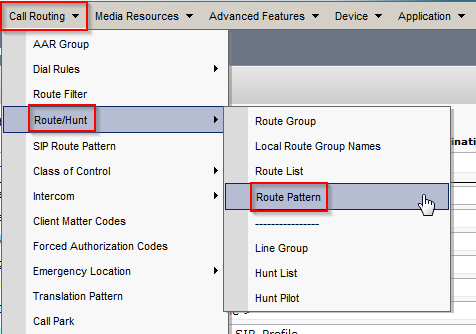 In CUCM, navigate to Call Routing > Route/Hunt > Route Pattern. Click Add New. Enter the voicemail pilot number you’d like to use under Route Pattern. Select the name of the Route List we configured earlier under Gateway/Route List. Click Save. 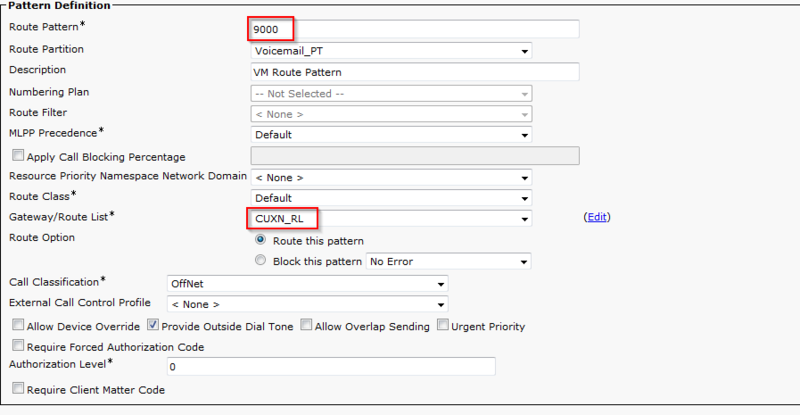 In CUCM, navigate to Advanced Features > Voice Mail > Voice Mail Pilot. Click Add New. Enter the Voice Mail Pilot number, this should match the Route Pattern we created earlier. Enter the Calling Search Space and Description, check Make this default… and click Save. 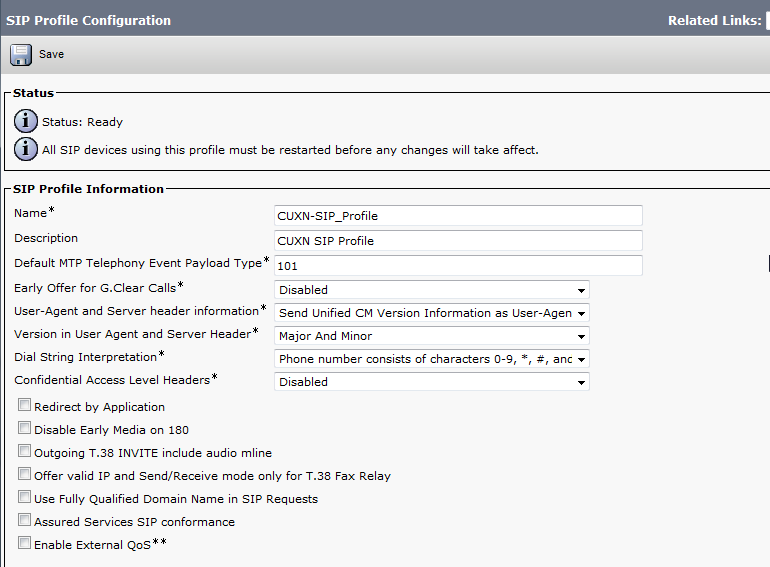 In CUCM, navigate to Advanced Features > Voice Mail > Voice Mail Profile. Click Add New. Enter a Voice Mail Profile Name and Description. Select the Voice Mail Pilot configured earlier. Check Make this the default… if you want this profile to be the system default. Click Save. 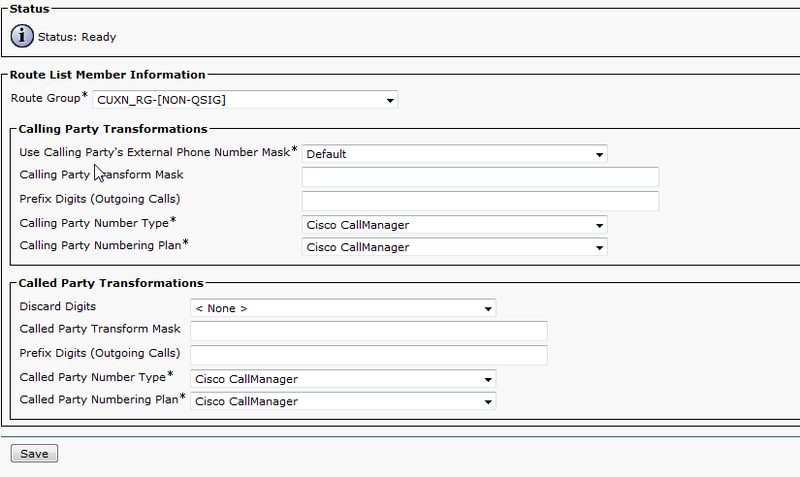 In CUC, navigate to Telephony Integration and then click Phone System. 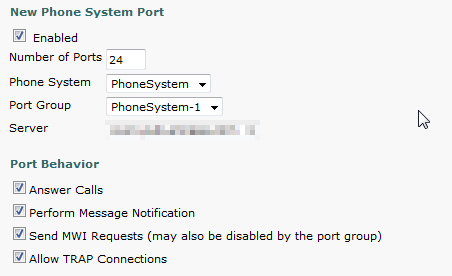 Click the default phone system and make any changes you’d like such as the Phone System Name. At the top right of the Phone System Basics page look for Related Links. Select Add Port Group and click Go. 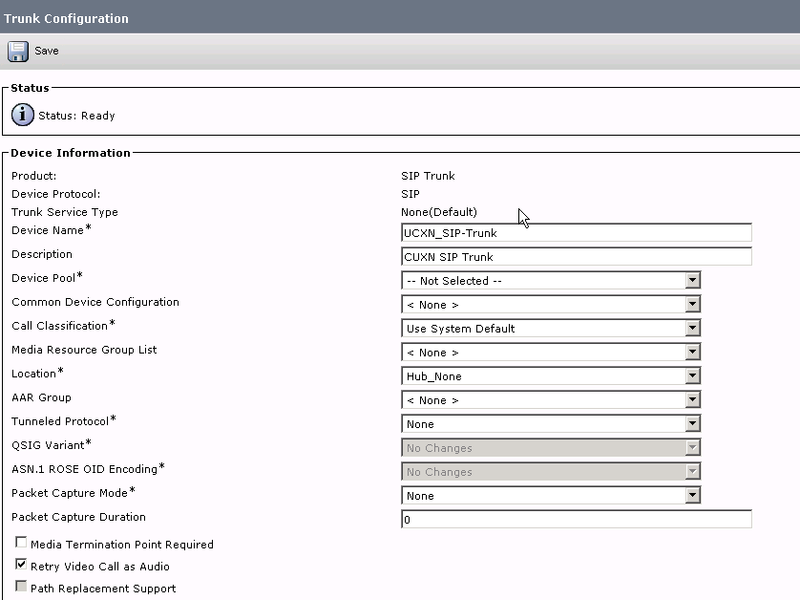 Under Create From, change the Port Group Type to SIP from the drop down box. Give the Port Group a Display name. 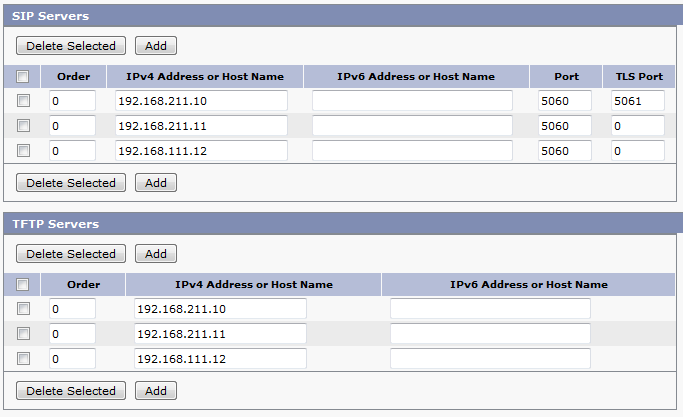 Under Primary Server settings enter the IP address of the CUCM server. Click Save. Under Related Links on the Port Group Basics page, select Add Ports and click Go. Enter the number of Ports and click Save. 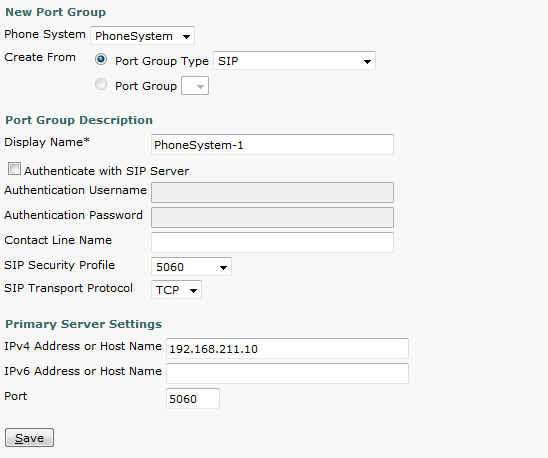 Navigate to the Port Group Basics by going to Telephony Integrations > Port Group > and click the newly created port group. Click Edit and select Servers. 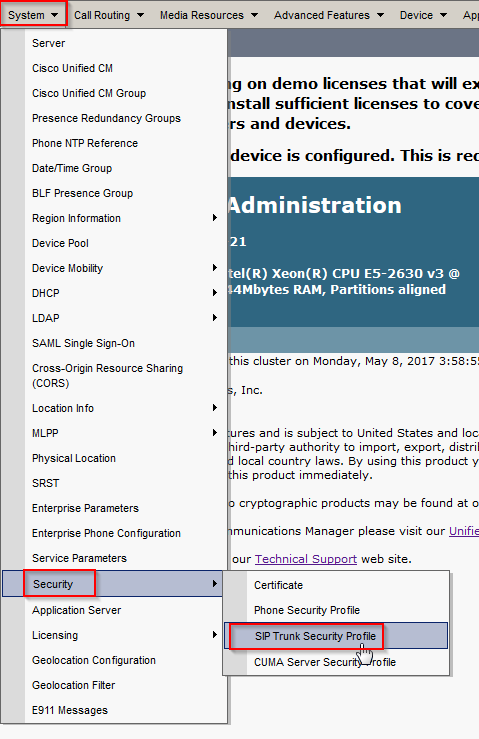 If you need to add secondary CUCM servers enter them under SIP servers. Follow the same steps to add additional TFTP servers. 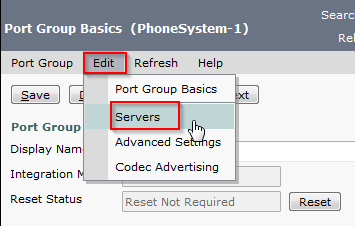 Click Edit > Port Group Basics. Click Reset to reset the Port Group. 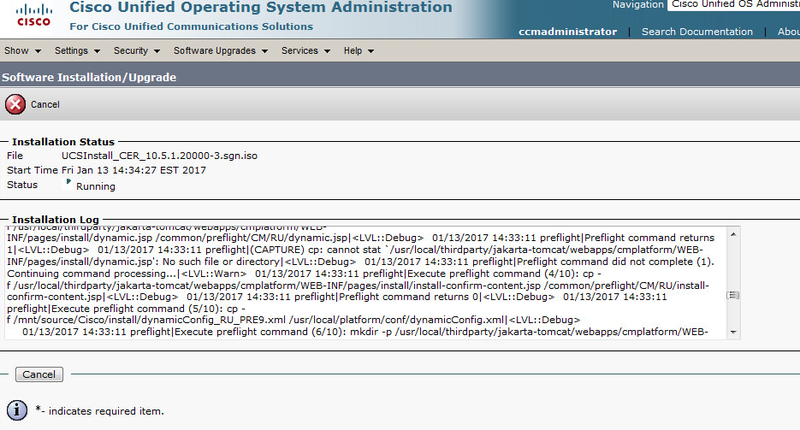 This should be enough to configure basic SIP integration between CUCM and CUC. 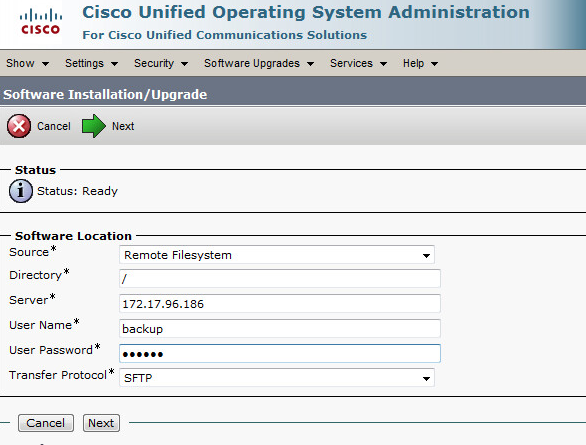 In CUCM you can navigate to Devices > Trunk and verify that the SIP trunk has been established. You can then test by dialing the voice mail pilot number and seeing if you hit Unity Connection. 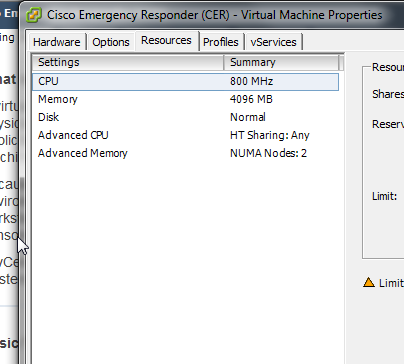 I was recently tasked with upgrading Cisco Emergency Responder 8.6 to 10.5. The 8.6 install just so happened to be on a physical IBM MCS server so I thought I’d document the steps of upgrading a physical install of CER 8.6 to a virtual CER 10.5 install, along with the software used to complete the upgrade. 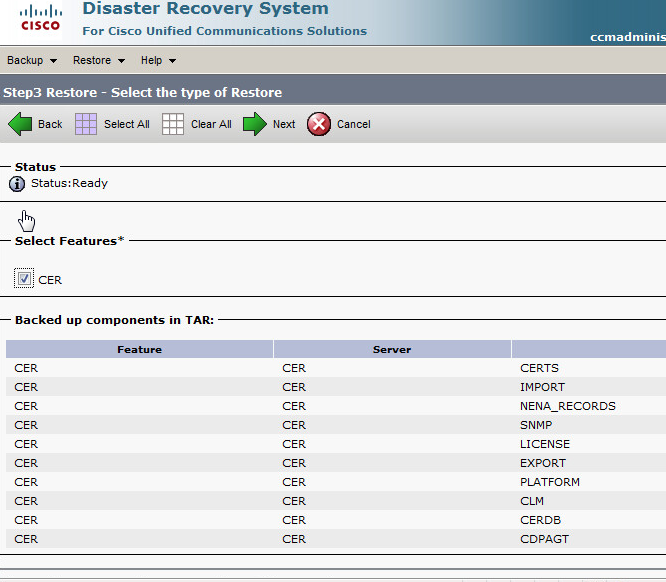 Log in to Disaster Recovery System by selecting it from the drop down box located on the top right of the CER login page and clicking Go. Select the Backup Menu and then navigate to Backup Device. DRS uses SFTP to securely transport the backup records. If you have a SFTP server already setup in your environment you can use that to create a manual up-to-date back up. For this upgrade, a SFTP server was unavailable so I had to use my laptop as the back up device. The software I used to accomplish this task was freeSSHd. 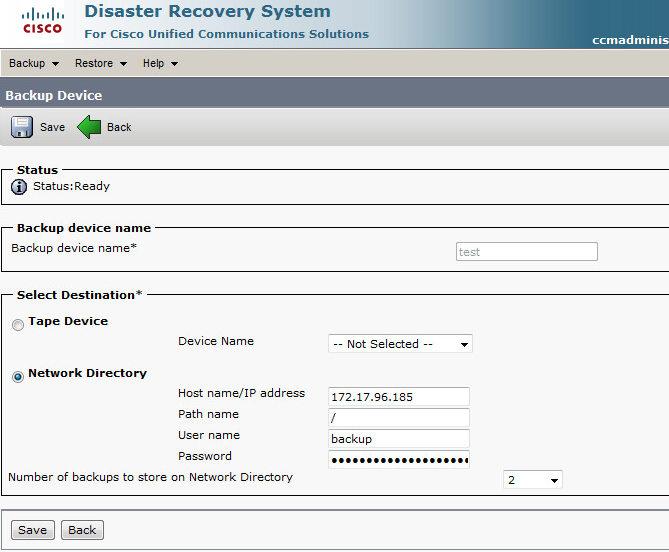 These next steps are an overview on how to configure freeSSHd as a backup device for DRS. 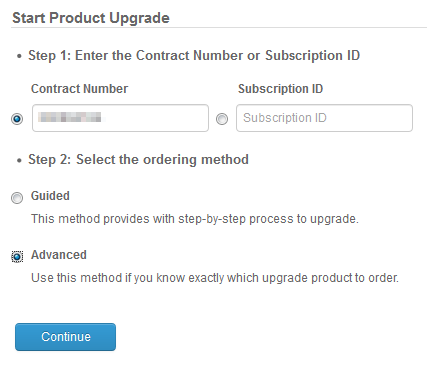 Open freeSSHd and click the Users tab and then click Add to configure a backup user. Click the SFTP tab and set the SFTP home path, the directory where the backup files will be stored. 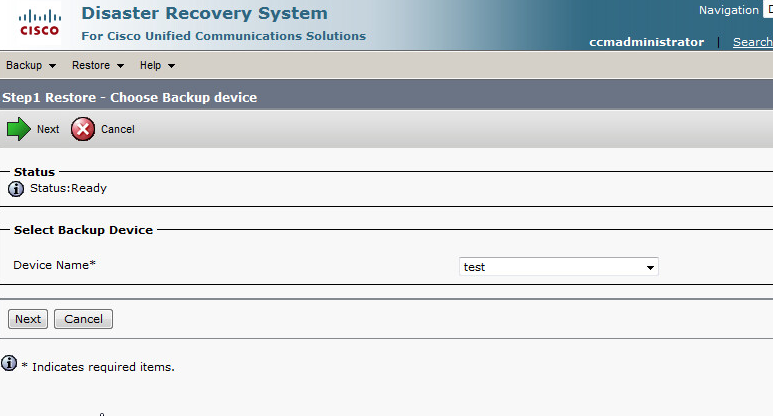 Now that freeSSHd is configured we can go back to DRS and configure the Backup Device. Give the Backup device a name, IP, path, and the username and password you configured in freeSSHd. 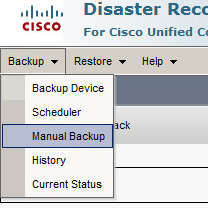 Once the backup device is configured click the Backup menu and select Manual Backup. 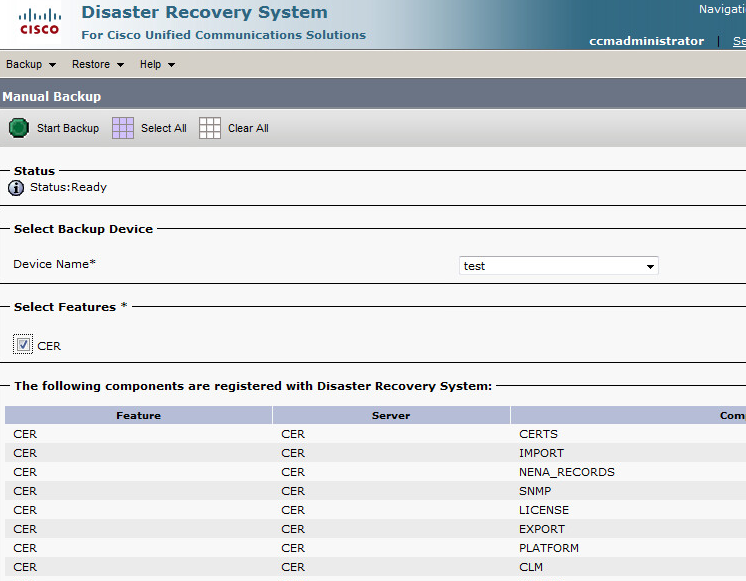 Select the device you configured and click CER to back up all registered CER components. 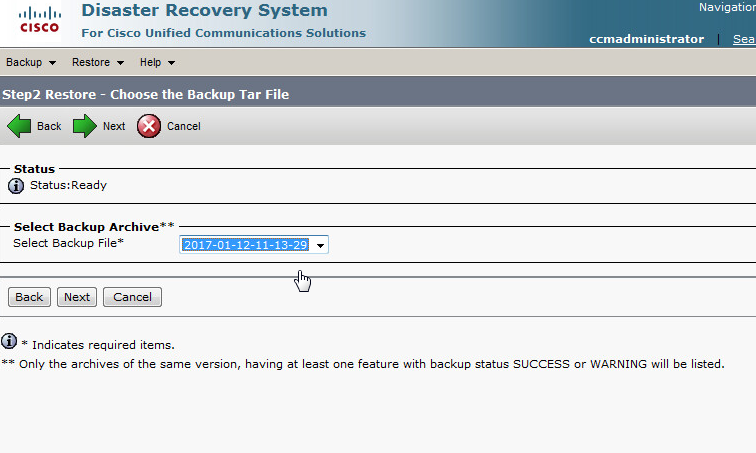 Click Start Backup, if everything is configured successfully you should see the progress bar advance and a number of tar archives will now be in your SFTP directory. 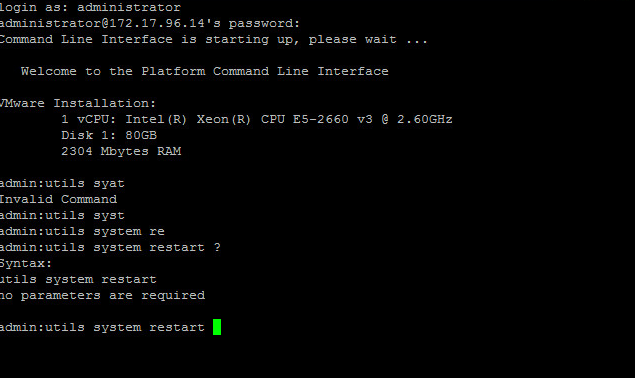 With a backup of the existing physical 8.6 install in place, we can now migrate to a virtual install of CER 8.6. The vmware ova and install media for CER 8.6 are unfortunately not on the Cisco downloads page. 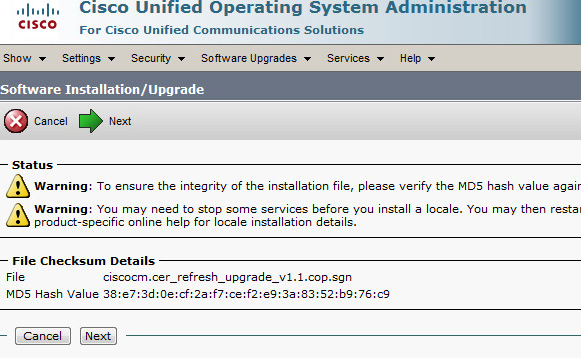 However, if you open a TAC case for assistance with a P2V migration, Cisco will make the download available to you. After you import the 8.6 ova you may also want to adjust the virtual machine properties so that CER 10.5 will be supported without issues. 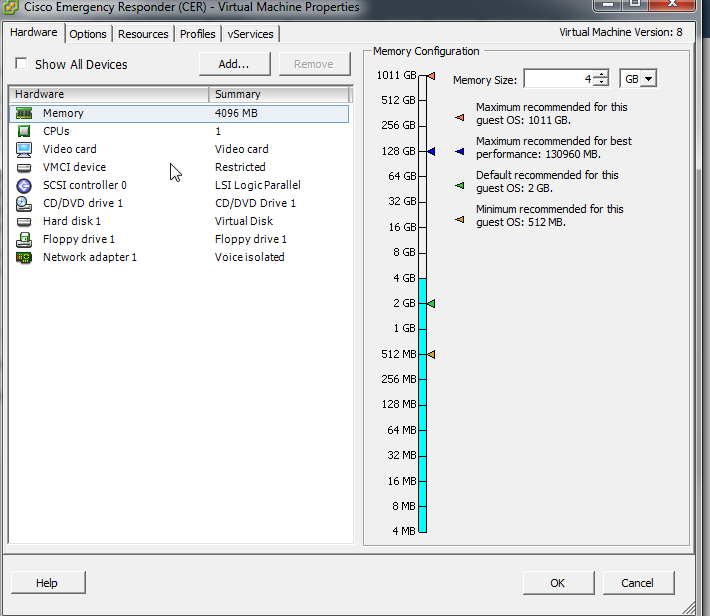 Increasing the memory to 4 GB, increasing the CPU resources, etc. Follow the on screen instructions to complete the basic CER install (if you want re-IP CER, now would be the time to do that, or if you want to keep the same IP address please be sure that the virtual CER is on an isolated network). Once completed head to the web interface and select Disaster Recovery System. Create your backup device on the by going to Backup > Backup Device. Go to the Restore menu and select Restore Wizard. Select your Backup Device and click next. Select your Backup Archive and click next. Select the features you’d like to restore and click next. 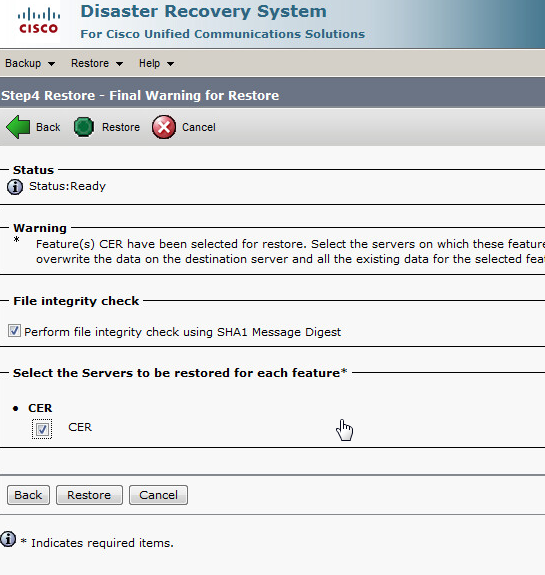 Select File integrity check and the servers to be restored then click Restore. Wait for the restore process to finish. Once completed you will need to reboot the virtual machine by SSH’ing into the server and issuing the utils system restart command. Next we can begin the upgrade process. 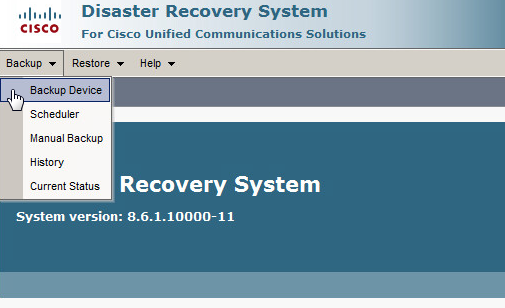 Select Cisco Unified OS Administration from the navigation drop down menu and click Go. 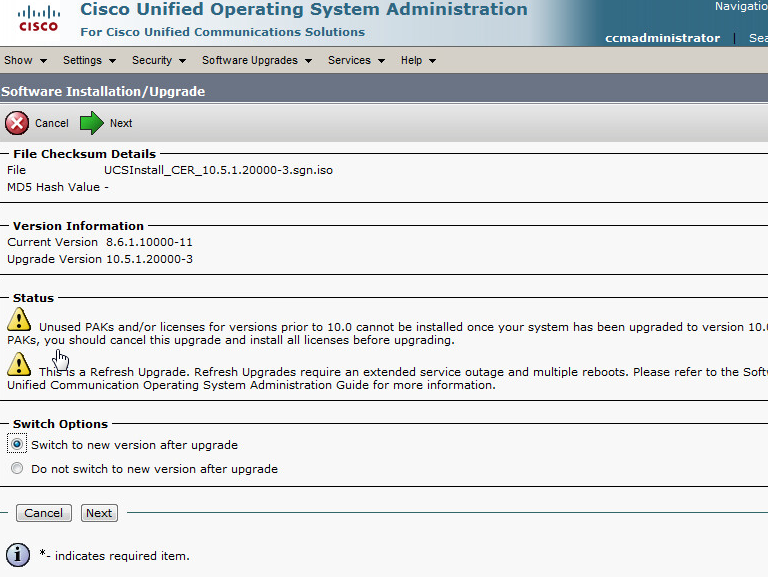 Select the Software Upgrades menu and click Install/Upgrade. 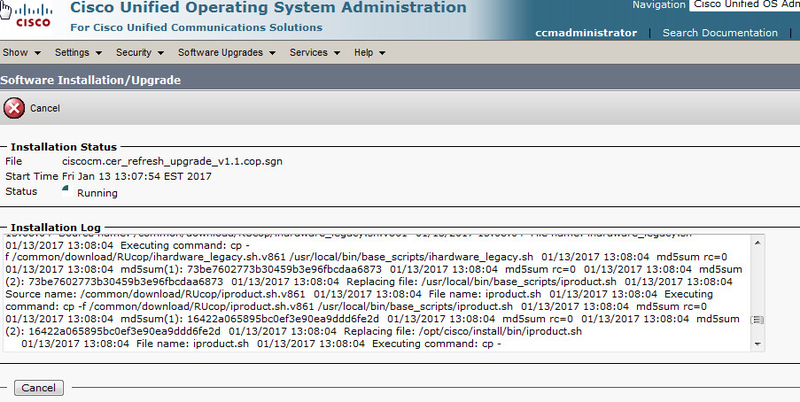 First we need to install ciscocm.cer_refresh_upgrade_v1.1.cop.sgn, a Cisco Options Package that is necessary to upgrade from 8.6 to 10.5. 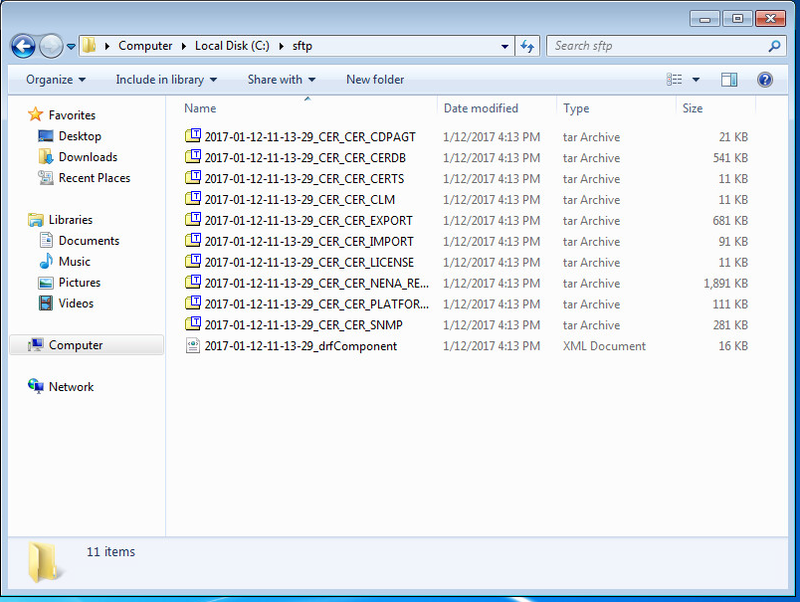 The file can be downloaded from Cisco and will need to be placed in your SFTP directory. Select Remote Filesystem as the software source. 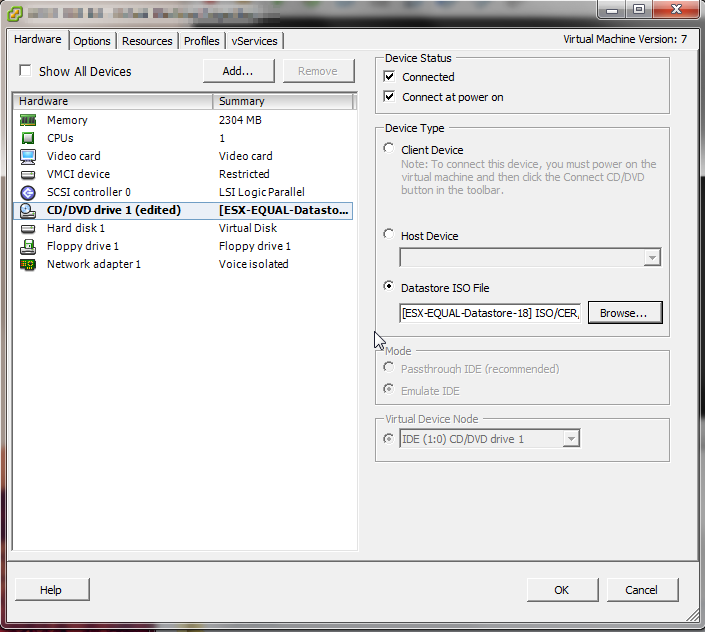 Configure the Software Location to point to your PC running freeSSHd then click next. 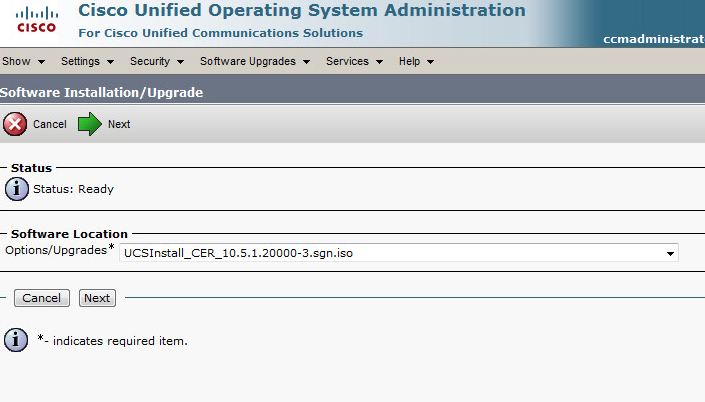 Under Software Location select ciscocm.cer_refresh_upgrade_v1.1.cop.sgn and click next. You should then see the install progress. Next, mount the 10.5 install media on the virtual machine. Select Connected and Connected at power on. 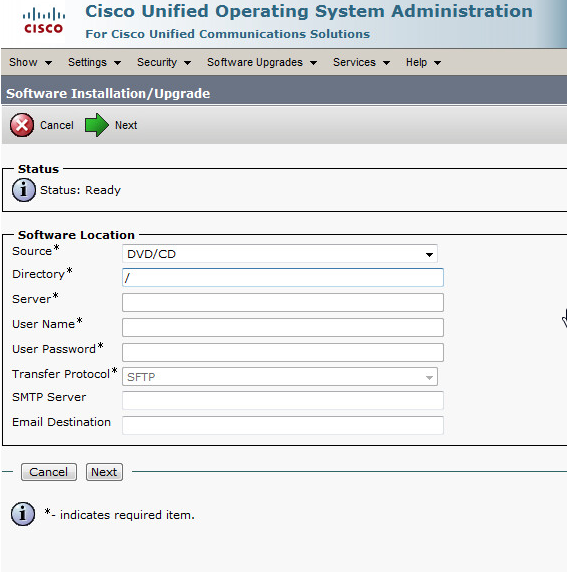 Select Cisco Unified OS Administration from the navigation drop down menu and click Go. 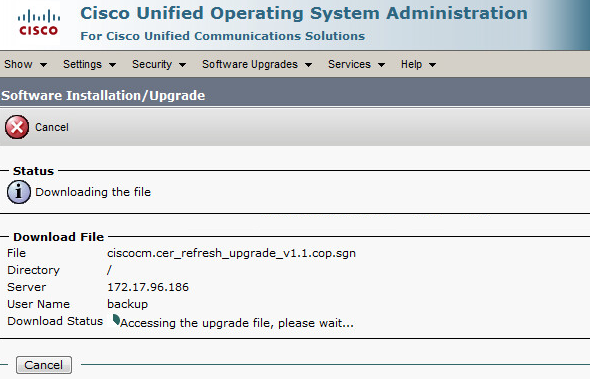 Select the Software Upgrades menu and click Install/Upgrade. Select DVD/CD as the software source and click next. Be sure the correct software version is displayed and click next. Select your Switch options and click next. 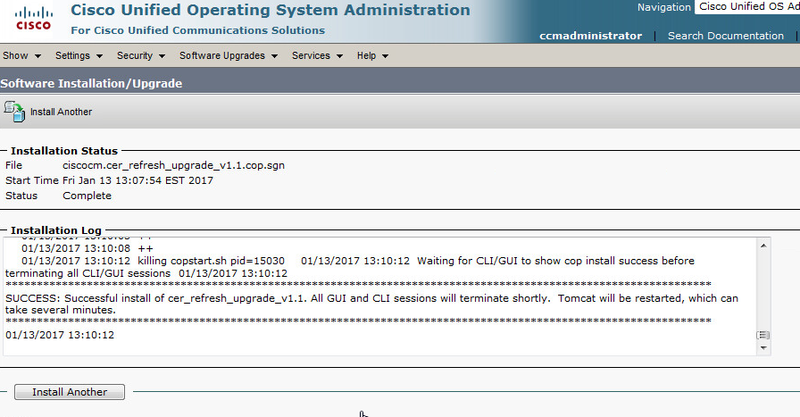 Follow the upgrade process on screen, when the system reboots you can view the install progress from the vmware console. And that’s it. Once completed you should now have a fully upgraded version of CER 10.5, complete with migrated data from the old physical installation.